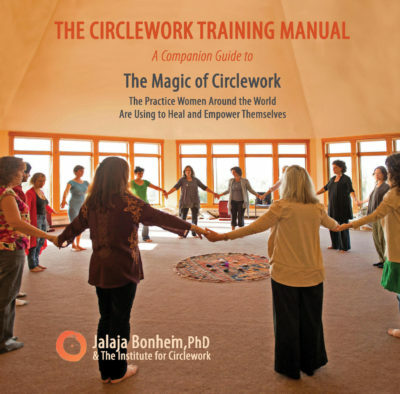 For over three decades, Jalaja Bonheim, PhD, has been training women from around the world in Circlework, a process that uses circle gatherings for healing, empowerment and peacemaking. Now, for the first time, she is making the powerful tools and concepts of Circlework available to a wider audience. Building on material covered in The Magic of Circlework, the Training Manual provides a wealth of practical guidance for anyone interested in deepening the level of intimacy and authenticity in groups they facilitate or participate in. This includes men, for while Jalaja’s personal focus lies on empowering women, she views Circlework as a practice that can benefit men equally. The Circlework Training Manual has three parts: Foundations, Practices and Challenges. Foundations covers all aspects of creating, organizing and leading circle gatherings based on the principles of Circlework. Practices offers a rich treasure trove of exercises and tools, not only for Circlework leaders, but for anyone who leads or participates in groups and wants to take the process to a deeper, more sacred place. Drawing on three decades of experience in training circle leaders from around the world, Jalaja Bonheim explains the practices and their implementation in simple, clear language. Challenges deals with the hurdles that circles may face. What to do if someone won’t stop talking? How to respond to Kundalini awakenings? How to work with conflict? Here, readers will find a treasure trove of advice that will benefit not only group facilitators but anyone who works with groups of people. If you haven’t experienced Circlework first-hand, please be sure to read the book first! Without the basic concepts, insights and understanding covered in The Magic of Circlework, you will not be able to use the manual effectively. Enter your email above to receive a notification when The Circlework Training Manual is available. A masterful book on how to launch a successful group dedicated to empowering participants. Jalaja’s treatment of every aspect of group work reflect her many years of experience as Circlework teacher and trainer. The Manual addresses all the practicalities of setting up a group, exercises to use during a session, and common challenges one may encounter when engaged in deep work. I’ve never seen such a rich compilation of exercises, some of which I’ll use in my own groups. The layout is beautiful and easily accessible. If you are a group leader or aspire to be one, this book is a must! The Circlework Training Manual is incredible! Jalaja did a masterful job of taking a complex spiritual experience and putting it into a clear linear form. The Circlework Training Manual is a seminal guide—clear, comprehensive yet accessible. Jalaja concisely outlines the essential steps to creating circles that are sacred, magical, transformative, and profoundly intimate. An extraordinary resource for leaders in schools, colleges, retreat centers, spiritual centers, community organizations, hospitals, corporations and conferences!